The Lakeland Terrier is a small to medium sized dog who is typically hardy, agile and full of character. He will enjoy being outdoors and busy all day and should have plenty of exercise. He would be a good family pet but would not appreciate being treated as a lap dog. 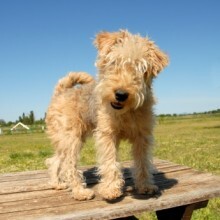 His coat is medium length and should be groomed often. It can be trimmed professionally a couple of times a year. The Lakeland is free from exaggerations and deformities.